Home/Answers/#6 Is Jesus Michael the Archangel? ← #7 Must Jehovah's Witnesses obey God's law? QUESTION #6: Where does it teach in the Bible that Jesus is Michael the archangel? Why isn’t Jesus called Michael right now since he is in heaven? ANSWER: This is certainly an inconsistent line of reasoning for a trinitarian to employ. To underscore that fact, Jehovah’s Witnesses merely have to turn the question around and ask the trinitarian: Where does it teach in the Bible that Jesus is part of a Trinity? And the answer is, of course, nowhere – nowhere in the Bible can be found the word Trinity or triad or even the concept of three gods in one, or three persons in one god, or whatever the definition du jour is. Trinitarians reluctantly admit that fact. And although multitudes ardently believe that God is a triad of identical, co-equal personages, despite the fact the Scriptures do not support that concept, it is deemed heretical that Jehovah’s Witnesses believe and teach that Jesus was and is Michael, the chief angel of Jehovah’s heavenly army. But the Scriptures do, in fact, strongly suggest that Michael is the same person as Jesus Christ. There is certainly more weight of evidence for it than for the Trinity. However, since God is obviously not an angel it is impossible for a person who has been indoctrinated with the Catholic Trinity to receive comprehendingly what the Scriptures actually say on this matter without first dislodging the Jesus-is-God delusion from their minds. Trinitarians are forced to resort to contrived translations, such as in the case of John 8:58, where most trinitarian-produced translations simply transliterate the Greek expression “ego eimi” with no consideration of the context and then unjustifiably transpose it as a title – “I Am,” claiming it to be a direct quotation from Exodus 3:14, where Jehovah God said in the Greek Septuagint, “ego eimi ho on” – meaning: “I am the being.” However, Jesus did not say “ego eimi ho on.” He merely said: “ego eimi.” By turning the predicate into a proper noun John 8:58 is not even a complete sentence. It is a nonsensical phrase. No matter, appropriately the verse has been enshrined by trinitarians as the very bedrock and foundation of their belief that Jesus is God. A grammarian might justifiably conclude that Jesus was speaking in some sort of Hellenic Ebonics. The indoctrinated trinitarian mind is forced to reject the most basic concepts of language. For example, every human who has ever lived has a father – someone who passed on life to him or her. If someone says they are the son of so-and-so, there is no confusion. Everyone understands the concept. Or, if a father says ‘this is my son,’ people do not have to consult with an expert in linguistics to determine what was meant. And if someone were to claim that they did not have a human father or that they were as old as their father, you might rightly suspect they had lost their mind. Yet, when it comes to the trinitarian’s concept of Jesus, no discernable father/son relationship exists; this, in spite of the fact that over and over again Jesus referred to himself as the obedient son and to God as his Father. Just why God and Jesus are consistently portrayed as a father and son is considered an unexplainable mystery. Trinitarian scholars have been employed for centuries trying to explain the absurdity – concocting impressive, but nonsensical theories, like the hypostatic union. The simple truth is: Jehovah is God and Jesus is the only-begotten Son of God. Everything else is from the Devil. Revelation 3:14 confirms this sacred truth, saying, that, as God’s faithful witness Jesus is “the beginning of the creation by God.” Although not all translations render the verse with that phrase the Greek word used in that passage that is translated as “beginning” is the same word as used at John 1:1. Since, as already stated, God had no beginning, “the beginning” is in reference to the beginning of God’s creation. Elsewhere, Jesus is explained to be the “firstborn of all creation.” Laughably, trinitarians claim that this does not mean that Jesus was the firstborn creature, but rather, he is merely the most prominent. They make this claim based upon the fact there are a couple of instances in the Bible where one who was not the actual firstborn son received the blessings entitled to the firstborn son, such as in the case of Jacob. But that is nonsensical claptrap, because, obviously, being firstborn only has meaning in relation to those who are also born, whether before or after. But in the case of God, he has no peers and he certainly was not born. Using the term of “firstborn” in any sense in relation to God is another meaningless absurdity embraced by trinitarians as if the very sacred secret of God. And the spirit son who eventually came to the earth and was known as Jesus Christ had the privilege of being the very first creature that God created – “the firstborn of all creation.” Entitled “the Word,” by means of this firstborn son Jehovah created all other things. That is why the Scriptures say that all things were created by means of him or through him – indicating the Word was the agency that God utilized. So, the firstborn of all creation was the only creature directly begotten, of fathered, by Jehovah God. What a privilege to be the firstborn of all creation and the only-begotten of Almighty God! Although there are many other sons in heaven, they all came into existence through the firstborn and were not directly created by God. This is why we read in Genesis, for example, that God invited another to join him in the creation of man, saying: “let us make man in our image and likeness.” And, obviously, since the Word is also said to be made in the exact image and representation of God, the Son must also be divine; hence, a god by his very nature. It was this divine nature that the Word left behind when he became flesh. It is explained in the 2nd chapter of Philippians that although the Son was in the very form and nature of God he did not seek equality with God, but instead emptied himself of his divinity and became human. Ironically, although trinitarians accuse Jehovah’s Witnesses of denying the divinity of Christ it was the prehumen Son of God himself who denied his own divinity when he forsook his life as a glorious spirit and left behind his privileged position in heaven, in order to have his perfect life miraculously transferred into human genetic code. During his 33 years on earth the Word did not exist. With this foundation established the relationship between Jesus and Michael the archangel can be better understood. We humans surely all have names. It is usually the first thing that is given a newborn babe by their parents. We even have names for our pets. And, of course, God himself has a name. It appears in the Hebrew text as four letters – YHWH. It has been translated into English as Jehovah and appears in the Bible almost 7,000 times. The Bible teaches that Jesus came to the earth in order to give his life to make it possible for God to grant salvation to the dying race that has descended from Adam and Eve. But when God and his son made man in their image, they set before our original parents the opportunity to live forever. Humanity only came to be in need salvation after our original parents sinned against God. The point is, the firstborn Son of God would not have been originally named Jesus before he came down from heaven. Jesus is his earthly, Jewish name, and it appropriately highlights God’s purpose in connection with him; hence, Jehovah is salvation. The truth is, the son is not left nameless. The evidence is abundant that Jesus’ heavenly name is Michael. Although simple-minded persons may refuse to believe it unless someone can produce a verse that explicitly states Jesus is Michael, by using our intelligence the connection can be discerned from the fact that all the things that are described in scripture as the sole prerogative of Jesus Christ are also attributed to either the great prince Michael or to an archangel. It should be noted that Daniel is a series of interconnected prophecies that are intended to reveal the developments in the world that lead up to Jesus Christ securing his kingdom. And all the prophecies in Daniel conclude with Christ destroying God’s earthly enemies. For example, the second chapter reveals that God will set up a kingdom that will crush all earthly kingdoms and will rule forever. The seventh chapter relates how someone like a Son of man gains access to the Ancient of days and rulership and dignity are conferred upon him. There can be no question as to the identity of the Son of man – he being Jesus Christ. So, the Prince of princes must be the same as the Son of man. The Prince of princes denotes the preeminent prince, does it not? A prince, of course, is the son of a king. Jesus also bears the titles of King of kings and Lord of lords. However, he does not bear the title of the God of gods. That designation is exclusively reserved for Jehovah God. According to the context, the King of the north comes all the way to his end during the time of the end. The time of the end is also known as the conclusion of the system of things. Jesus explained that the conclusion would coincide with his return. Whereas, the other prophecies of Daniel depict the Son of Man and the Prince of princes annihilating the last human kingdom, the last chapter of Daniel reveals that Michael, the great prince and protector of God’s people, is the one who stands up against the king of the north. Clearly, to “stand up” means to rule as a king. In harmony with all the prophecies of Daniel, Michael standing up can only mean Jesus Christ coming in his kingdom. It is noteworthy that Daniel relates that Michael stands up during a time of distress such as never occurred in history. And, of course, Jesus Christ himself said that a great tribulation would occur such as has never occurred before, nor the likes of which will ever occur again. But just as in the case of Daniel, Jesus has assured us the tribulation will be cut short in order that some flesh may survive. Why is it, though, that, in the tenth chapter of Daniel Michael is merely described as one of the foremost princes, whereas in the eighth chapter he is called the Prince of princes and the 12th chapter depicts him in the role previously assigned to the Son of man? The difference is, in the 10th chapter of Daniel Michael was revealed as being a supporter of Daniel’s people during their captivity in Persia. Obviously, though, that was before Christ came to the earth and was given all authority. It is history. But the prophecies in the eighth and 12th chapters of Daniel are in reference to the great prince at the time he takes up he is ruling authority over the world during the conclusion, in the future. This change is noteworthy. Some trinitarian’s point to the letter of Jude, where Michael the archangel is said to have had a dispute with Satan the Devil regarding the disposition of Moses’ corpse. And because the letter says that Michael deferred to God’s authority, saying: ‘May God rebuke you,’ some use this account to say that this could not possibly be Jesus, since Christ had authority to rebuke the demons when he was upon earth. But such persons seem not to realize that Moses lived about 1,500 years before Christ; again, the son of God was not given full authority over heaven and earth until he came to the earth; specifically, when he was anointed at his baptism. 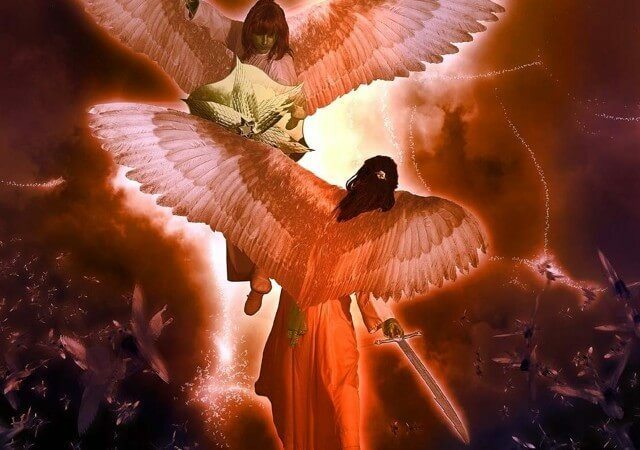 As an indication of the change in the authority the archangel possesses, the 12th chapter of Revelation reveals Michael leading all of God’s angels in the war against Satan and his angels. At that point in time not only does Michael have full authority to rebuke Satan he delivers a withering blow, booting him out of heaven – hurling he and his wicked legions down to the earth in a stunning defeat. Honest reasoning persons have to ask why Jesus is not present in that scene. After all, Jesus is the seed of the woman who was foretold back in the Garden of Eden to be the one to crush the head of the serpent. Surely, Jesus is not going to delegate to any other angel or to any of the holy ones his privilege of destroying the one who brought about his torturous death when he was a man. And the ouster of Satan from heaven commences the short period of time before the demons and their king are put out of commission entirely by being thrown into the symbolic abyss. When Jesus was upon the earth, through their tortured proxies, some demons spoke to Jesus and asked if he had come to destroy them or if he was there to throw them into the abyss. So, they recognized Jesus as the seed of the woman. Yet, in the 20th chapter of Revelation it relates that an angel comes down from heaven and seizes Satan and binds him with a chain and hurls him into the abyss. Again, where is Jesus in this scene? The answer ought to be obvious: Jesus is Michael the archangel – the destroyer of Satan. Not only is Jesus commissioned to crush Satan, he is also authorized to perform the resurrection. In fact, Jesus referred to himself as “the resurrection and the life.” Back in the 12th chapter of Daniel, when Michael stands up, not only is it the end of Satan’s beastly system upon the earth, but the next verse states that there will be those asleep in the dust of the earth who will wake up. In other words, the resurrection will commence shortly after Michael begins ruling. Why does Paul refer to Jesus waking the dead from their sleep with an archangel’s voice? Again, the only logical reason is because the apostle knew Jesus is Michael the archangel. Related article on e-watchman Is Jesus Michael the Archangel?